About: This is a slightly unusual Tarot spread in so much that it does not consider the past and present but looks exclusively at the next 12 months. A thirteenth card is drawn as an overall significator for the year and any card whose meaning is in doubt should be read in conjunction with this card. 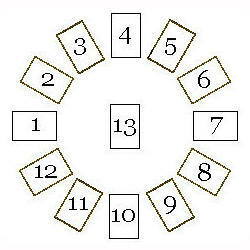 It is possible to lay out a further twelve or twenty-four cards to give a greater depth to each month. Notes: Refer to card 13 if the meaning for any other card is unclear. Although this spread is usually used for a general look at the next twelve months, it can be targeted in a specific direction if required. This spread can be done with just 12 cards with the significator being omitted if desired. It is also suitable for a shorter time spread such as 6 months.